Telangana State Engineering, Agriculture & Medical (Pharmacy,Veterinary etc.,) Common Entrance Through Computer Based Test (CBT) Engineering, Agriculture & Medical (Pharmacy,Veterinary etc.,) Common Entrance Test (TS EAMCET) is conducted by Jawaharlal Nehru Technological University Hyderabad on behalf of TSCHE.This examination is the prerequisite for admission into various professional courses offered in University/ Private Colleges in the state of Telangana for the academic year 2019-2020. TS EAMCET 2019 Notification/ Telangana EAMCET 2019. Telangana State Council of Higher Education (TSCHE) has announced the TS EAMCET Schedule Notification 2019. TSCHE will conduct TS EAMCET 2019 Entrance Examination in Telangana State. The TS EAMCET 2019 Timetable has been published by the Telangana State Council of Higher Education (TSCHE). The Telangana EAMCET (Engineering, Agriculture & Medical Common Entrance Test) is held by the Jawaharlal Nehru Technological University Hyderabad on behalf of TSCHE in the month of May 2019. Registered candidates can now check out the dates of the exam here. 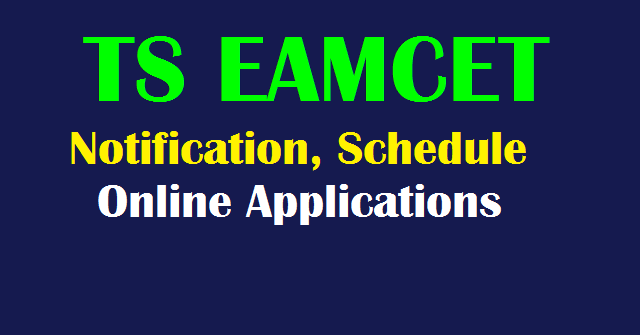 TS EAMCET 2019 Notification, Schedule, Online Application Form, Eligibility Criteria, How to Apply, Last date, Entrance Exam Date/ Date and Time of the Test or Examination, Important dates, Exam Fee Details, Hall Tickets, Results, 1st, 2nd, 3rd and Final phase counselling details, Admissions Process are details are given in this page. The TS EAMCET 2019 Timetable has been published by the Telangana State Council of Higher Education (TSCHE). The Telangana EAMCET (Engineering, Agriculture & Medical Common Entrance Test) is held by the Jawaharlal Nehru Technological University Hyderabad on behalf of TSCHE in the month of May 2019 . Candidates can now check out the dates of the exam here: A Common Entrance Test, designated as Engineering, Agriculture and Medical Common Entrance Test-2019 (EAMCET-2019) of Telangana State will be conducted by JNTU Hyd for entry into the professional courses like Engineering, Agriculture for the academic year 2019-20 in the State of Telangana. 2. Candidates should belong to the state of Telangana /Andhra Pradesh. 3. Candidates should passed intermediate/ 12th class from recognized Board of TS/ AP state with Physics, Mathematics, and Chemistry or Biology/Biotechnology as major subjects . Age: Candidates should have 17 years of age as on 31st December of the year of Admissions. Candidates are advised to check TSEAMCET 2019 Official Notification PDF for course wise eligibility details. The EAMCET-2019 Exam pattern is same as last year. Botany-40 Marks, Zoology -40 Marks, Physics -40 Marks, Chemistry - 40 Marks. EAMCET exam will be conducted separately for Engineering, Agricuture and medical admissions. The application form cost of Rs 250/-. Candidates can apply till two days before of exam date with late fee of Rs.10,000. But these candidates will be allotted Centres at Hyderabad, Secunderabad only. Eligible candidates who wanted to apply for EAMCET-2019 may submit their applications through . TS EAMCET 2019 online Application will be available at http://eamcet.tsche.ac.in/TSEAMCET/EAMCET_HomePage.aspx Read the instructions carefully and fill the application form. Submit the filled in application form on or before last date. The Registration fee may be paid at TS Online /AP Online / Mee Seva / e-Seva centers in Telangana State or A.P. /through Payment Gateway (Credit card/Debit card).